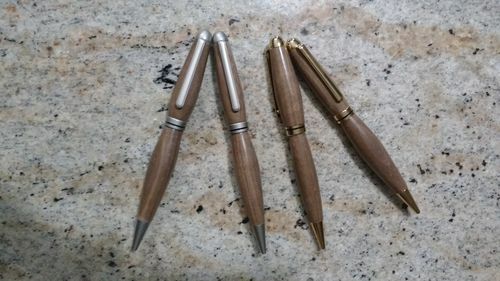 A couple more pens that I recently turned while doing demonstrations for the kids at school. The two kits are the Slimline and Euro/Summit kit. Woods used are (pic 1) Cherry, Ambrosia Maple, Purple Heart and (pic 2) Olive wood and Blood Wood. So far the kids have really taken to the new project(s) and are starting to turn out some nice pens. A few of them drove to Rockler over the weekend and spent a teenage fortune on blanks and kits, which was awesome to hear. Thanks for looking. I still have a couple more to finish before the 25th of December, so stay tuned! nice work buddy and its great that your getting those kids interested in more than video games and texting,keep it coming. Nice work Tooch! They look great! Nice to here that the kids are enjoying something other that plying on a game console. Now they’ll have something to show for their time spent. Not Bad! What finish are you using? I just ordered some more Kits from Lee Valley, Streamlines and going to try the simple stick pens. Try some Walnut if you can, these were finished with Hard Wax. Very nice looking pens, Mike. You are going to get me to try them!! They look great Tooch. Maybe with some of the students involvement and if you are lucky, they give you a pen for Christmas. How cool would that be. Beautiful pens…I bet you can’t find those in stores. Wow, Tooch. I haven’t looked at your work in a while. I’m inspired. I haven’t been getting notifications, evidently, when you post.